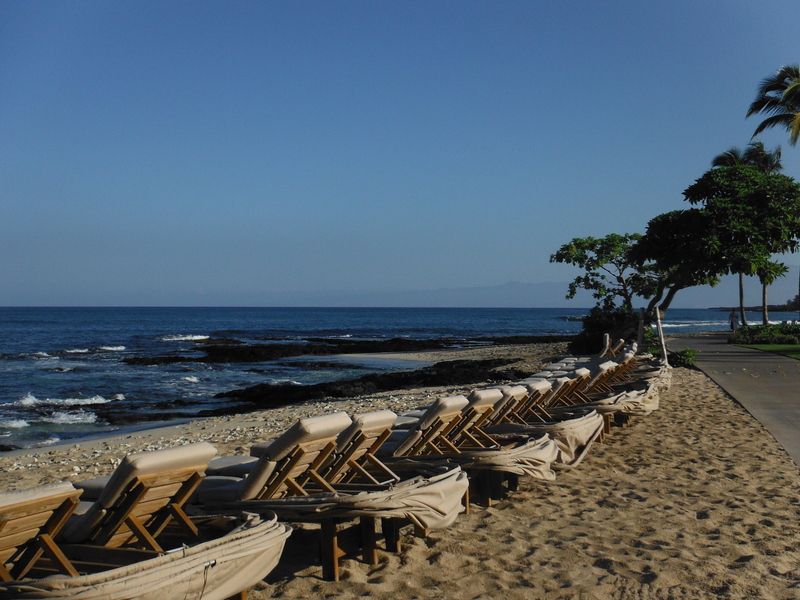 The Four Seasons Hualalai won the best hotel in the world award by Tripadvisor in 2013. Now if this doesn’t raise your expectations, I’m not sure what will. 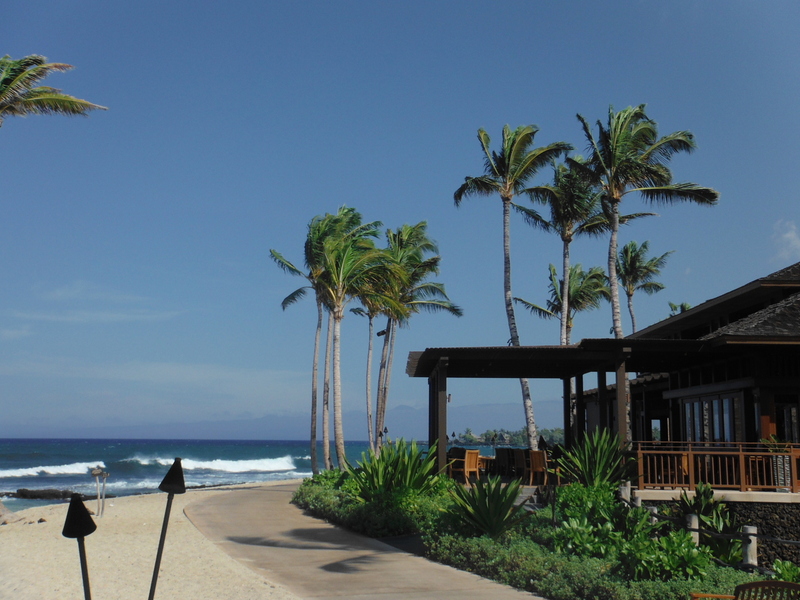 If you are flying into Kona airport your Four Seasons Hualalai experience will start about 10 minutes after you leave the airport terminal. You will be greeted at the gate a few miles from the resort. This ensures the hotel is fully ready for your arrival. As you drive through the sweeping roads, villas and golf course to the resort you can’t help but be excited, especially us first timers. As you pull into the lobby area the guest services crew reminds you not to worry about a thing when you exit your car. 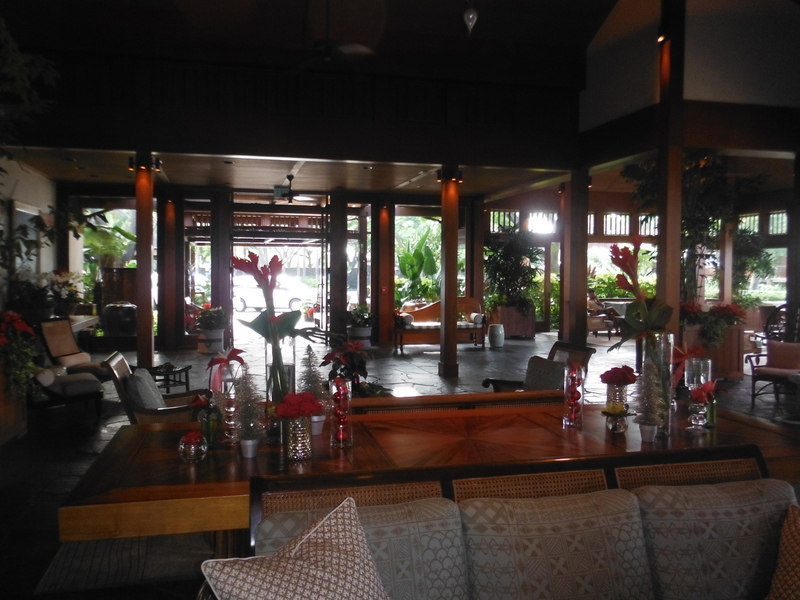 Of course you will be addressed by name and shortly after enjoy a Lei greeting, fresh flowers for the ladies. Next you will be graciously walked into the open air lobby and asked to have a seat on their couches with a refreshing towel, fruit and adult beverage right in front of you. The agent will go over details of your reservation and then take your credit card probably putting on a preauthorization the amount of several of your mortgage payments. At this point you may imagine we had a lump in our throats but just before handing over that credit card we received an upgrade to an ocean view room. This I wasn’t expecting and looking back it’s only going to pain my wallet more since now that I’ve done it anything less just won’t be the same. I was still thrifty enough to use the complimentary parking so our agent who would take us to the room had all our bags piled on the golf cart and followed me to the parking spot. Finding out it was our first visit he gave us a great tour of the grounds. Initially they may feel expansive but after a few hours of exploring you’ll get your bearings and keep in mind it’s only a 7 minute walk from one side to the other in case you get lost. 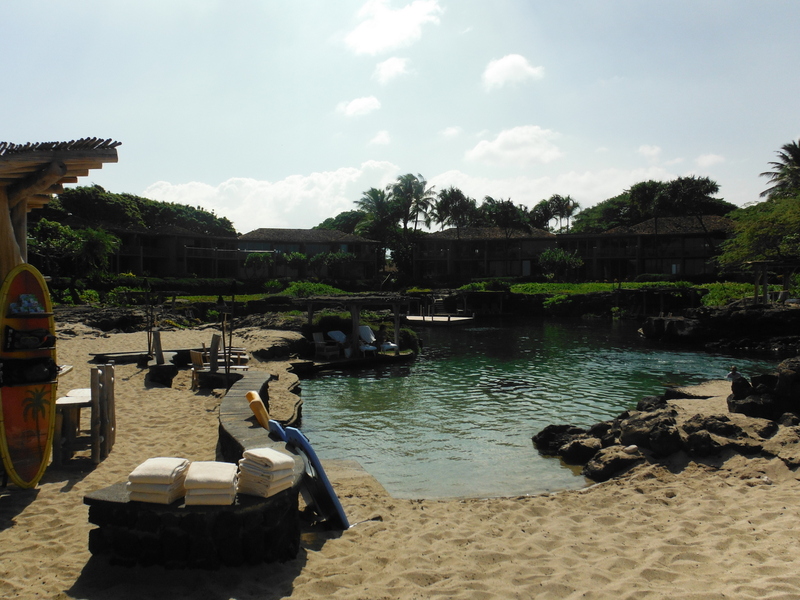 Getting lost is part of the fun at resorts which maintain their grounds to this level. 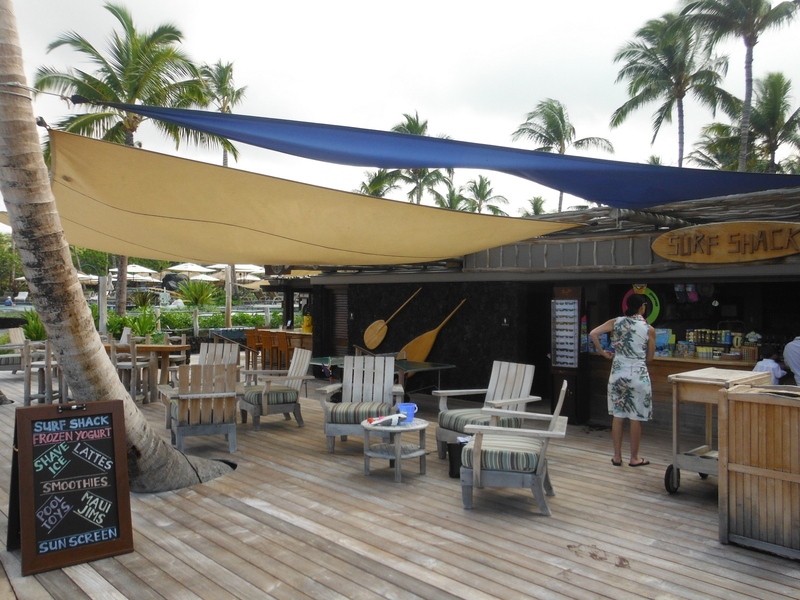 Unlike most other resorts the beach cabanas had the least use I’ve ever seen. We did spend a few hours beachside but the majority of our stay was spent pool hopping and snorkeling at Kings Head Pond. All the rooms at this hotel have the same layout except for one big exception. They are built in a two story duplex style. 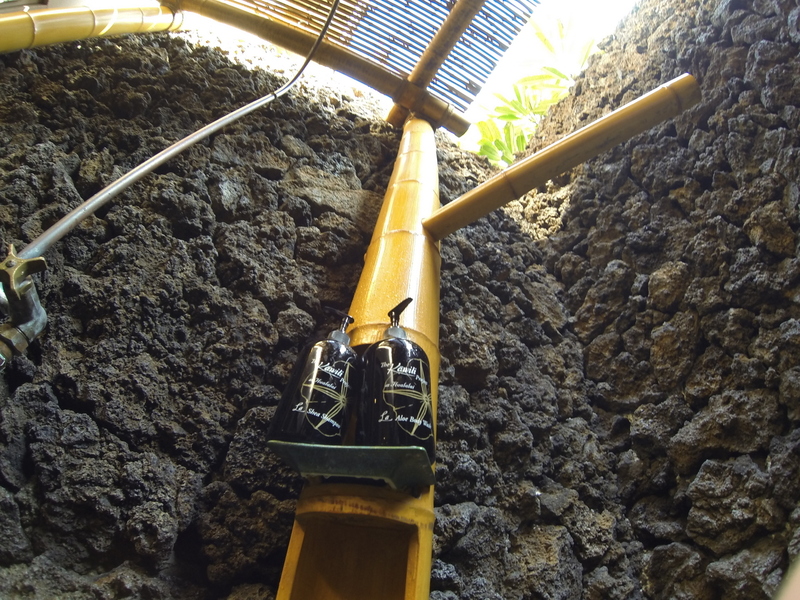 The bottom rooms have an outdoor shower in addition to the indoor one. 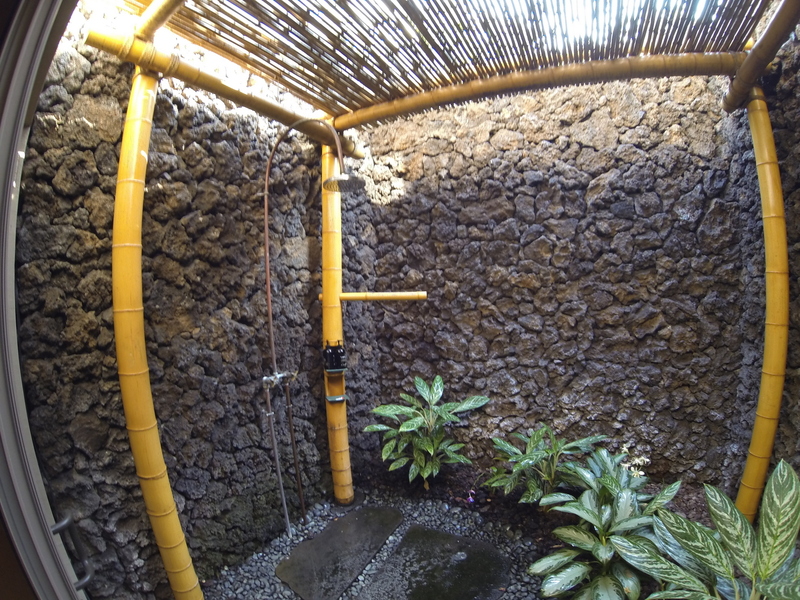 This shower is surrounded by rock and has some bamboo overhead so the bathrooms above can’t peep in. 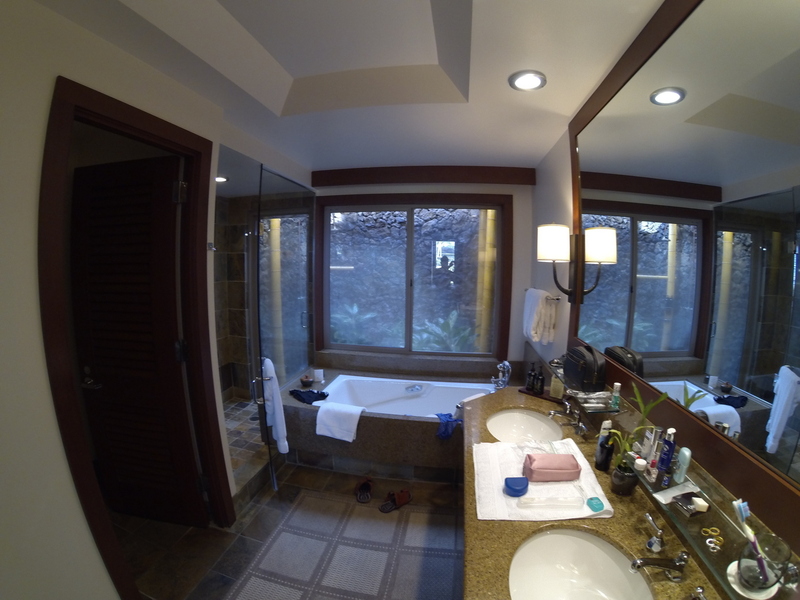 Views and outdoor showers aside all rooms are the same. Suites are another level here. I suggest you get in touch with the hotel directly in case you are in that league. Suite customers do get a few additional benefits but once again I don’t know the details of those benefits so I would get in touch with the hotel. 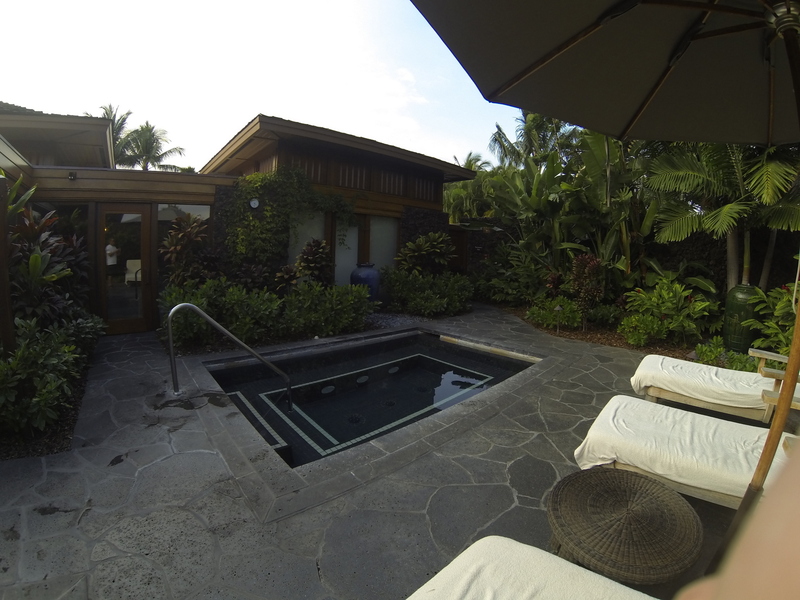 I did notice a few of the suites have full yards just 40 feet from the ocean, I can only dream of having one of those. 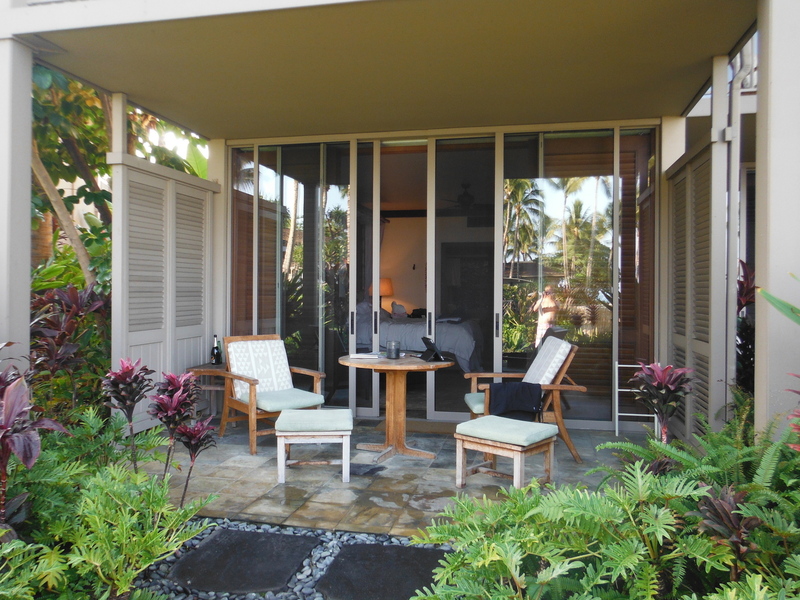 The bottom floor unit lanais (balconies) walk out onto the green space in front. 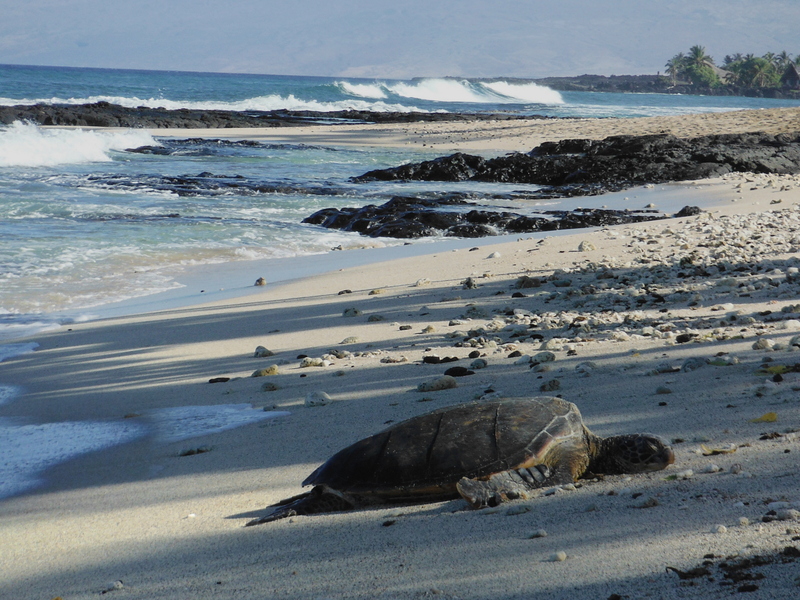 This can make getting to the pool nearby very easy. 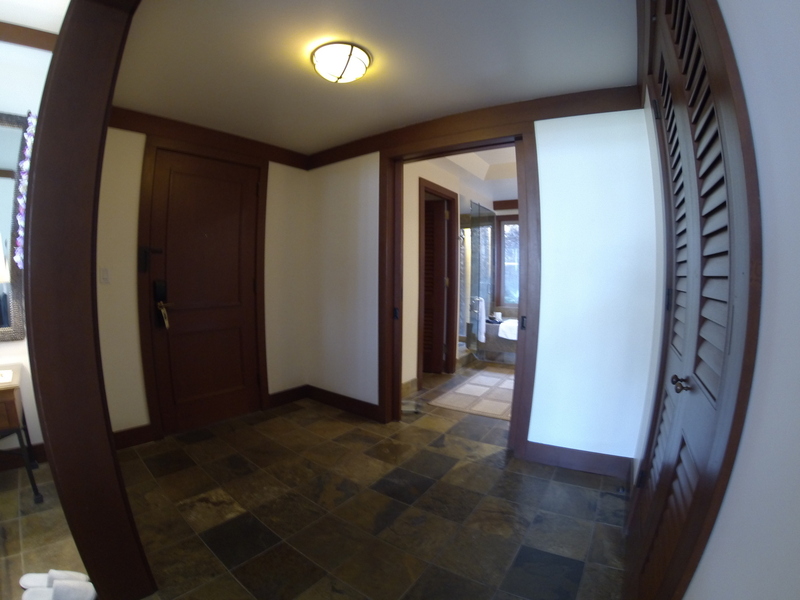 However other guests in nearby rooms may have to walk on these same paths which can be as close as 20 feet from your lanai. So the advantage of the second floor units is better ocean views since you are higher but also more immediate privacy. The people I travelled with were split between preferences of having a first or second floor room. 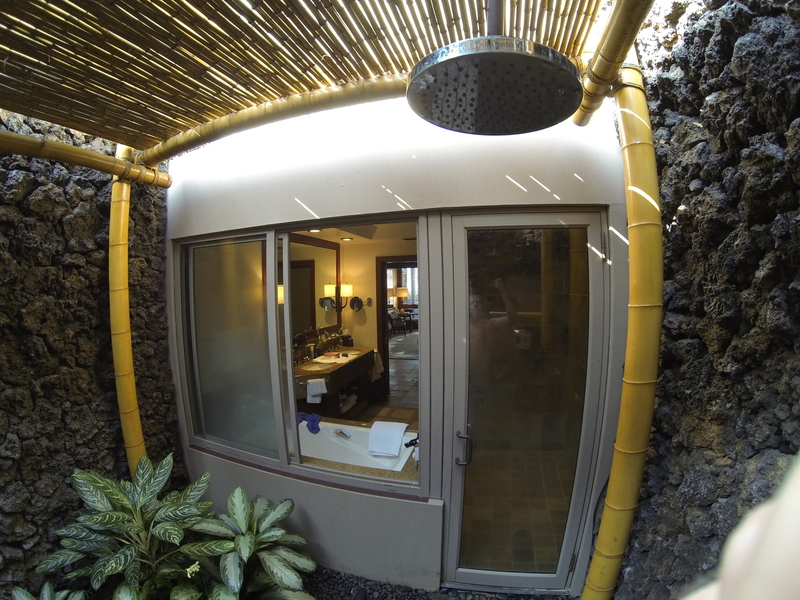 I personally really enjoyed the outdoor shower, especially since I could even see the ocean from it through the entire room. 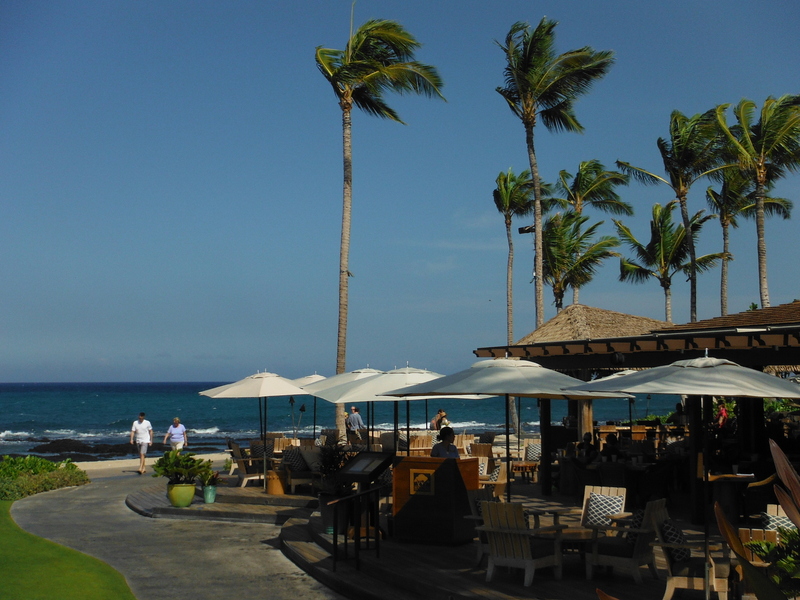 I found the view of the ocean great from our outdoor seating area. The neighbours I did see walk by all had huge smiles and were friendly but fast and didn’t peer into the room. The rest of the room was excellent for a hotel room. Furniture and finishing’s were in nice shape, big closet off the entrance, double sinks, toilet with a separate door and phone (Who uses those?!? Ewww…). It has a flat panel TV which I imagine has HD channels even though I never even turned it on. 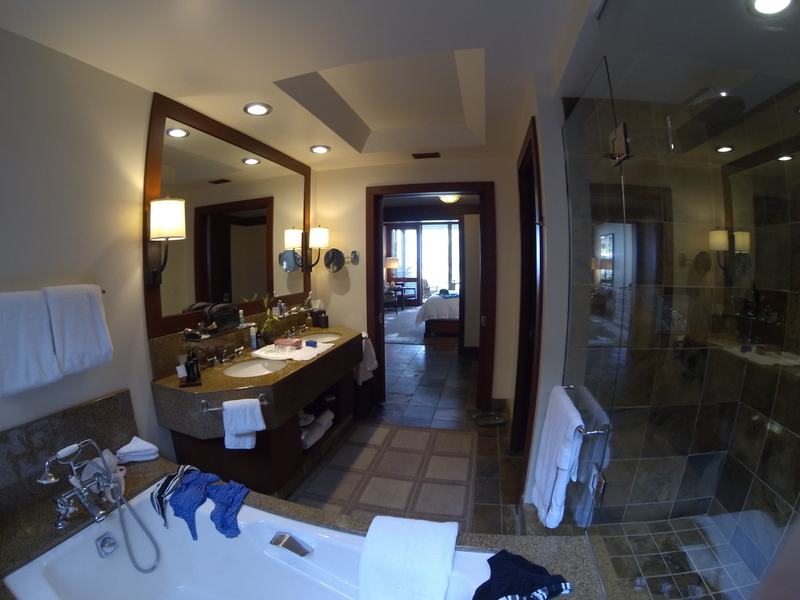 The hotel is 16 years old so the bathroom finishing may not be cutting edge but fit the bill and are super clean. Bath amenities were a local brand and in large bottles meant for multiple guests and to reduce plastic waste overall. The scent screamed Hawaii but once I got the major lemongrass tone I couldn’t help but think of Thailand. I really liked the bath soaps, my better half did express concern they were a bit potent and since many people have allergies these days she felt the aroma could have been softened. 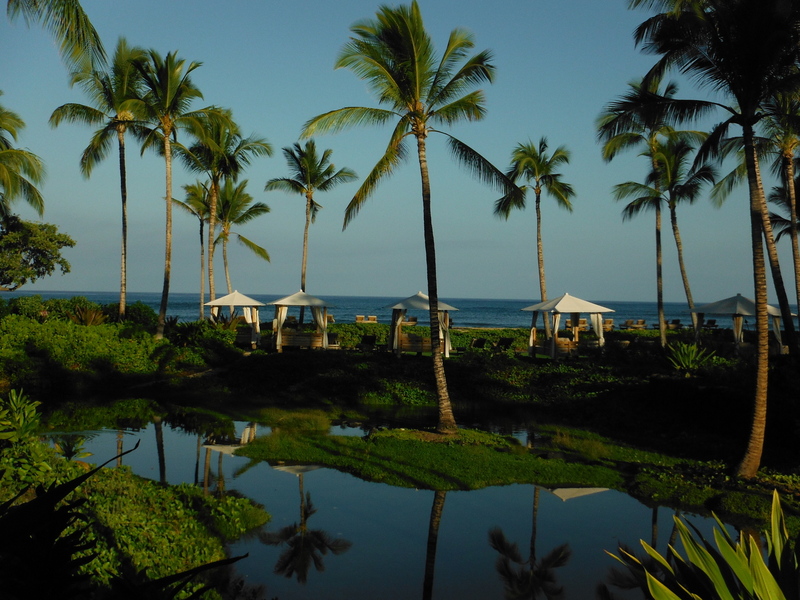 But getting back to environmental stewardship the Four Seasons Hualalai does a fair bit of promoting itself as such a hotel. They have water dispensers next to each ice machine which seems to be every 80 feet. My water never got below half full while relaxing in one the hundreds of different loungers. The turndown service includes a carafe the size of a litre of water. However one evening they even surprised me, there was a bottle of Hawaiian Springs bottled water tableside. According to the literature in the room this wasn’t supposed to be their plan, but what do I know, perhaps the filter system went kaput. The basic rooms at this hotel have a golf course view with the ocean in the distant background. 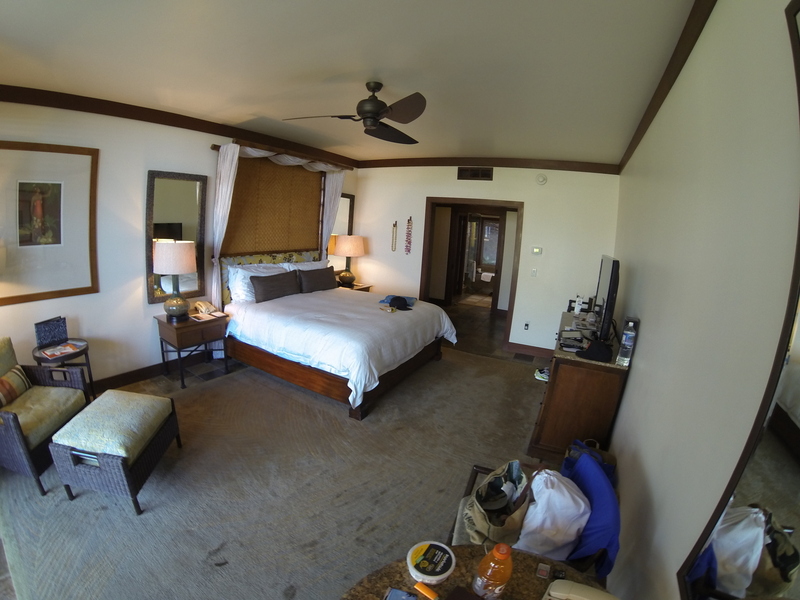 However these rooms may be the most private since only golfers or maintenance workers are around. 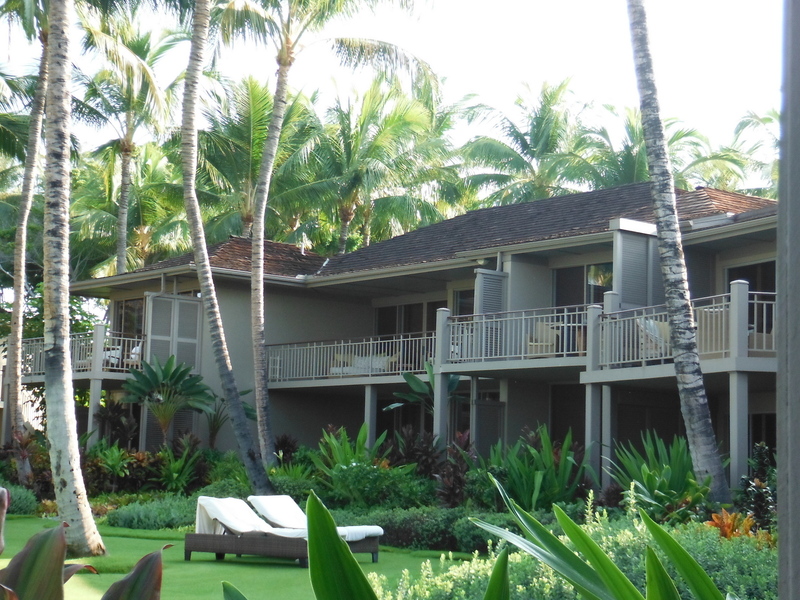 During the night it’s very unlikely anyone will walk by your lanai. The remainder of rooms are alcoves (semi-circles) around one of 3 pools or the saltwater Kings Pond. We enjoyed our adult pool alcove; this pool has a swim up bar open 11am-5pm, hot tub, infinity edge and only 24 seats with every two seats sharing a table. 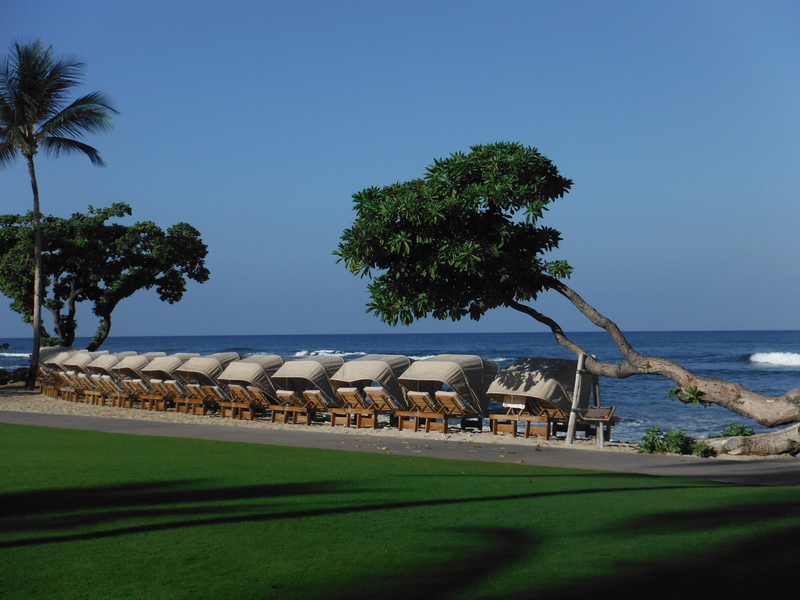 In front were the only 5 cabanas available for rent on property and the beachside cabanas. This alcove felt the most intimate and we would request it in the future since we have no kids, whoop whoop….yet. 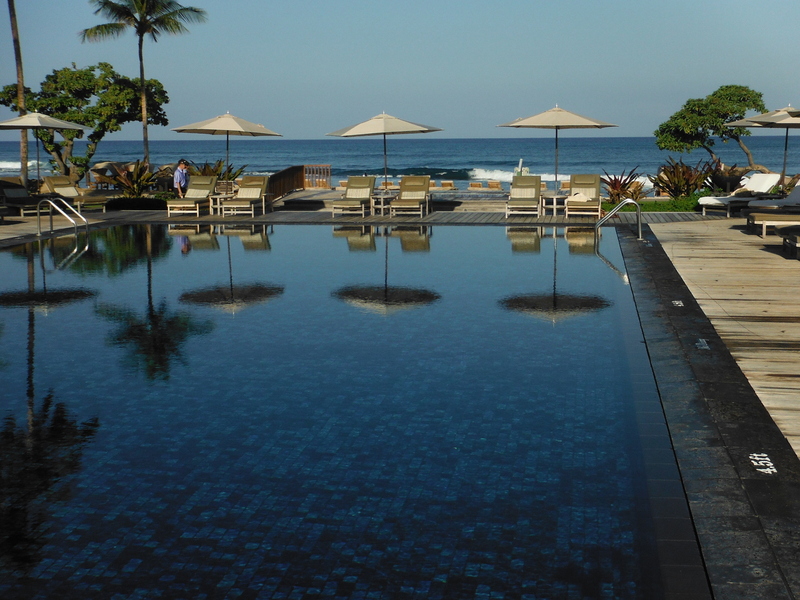 The pool just north called the beach tree pool is also referred to as the quiet pool. Children are allowed but there is no splashing. Another bonus, usually even more of an annoyance than a child having fun is no cell phone talking or ringers on. So if you are about to close that big deal please answer that call right by the smoking section. 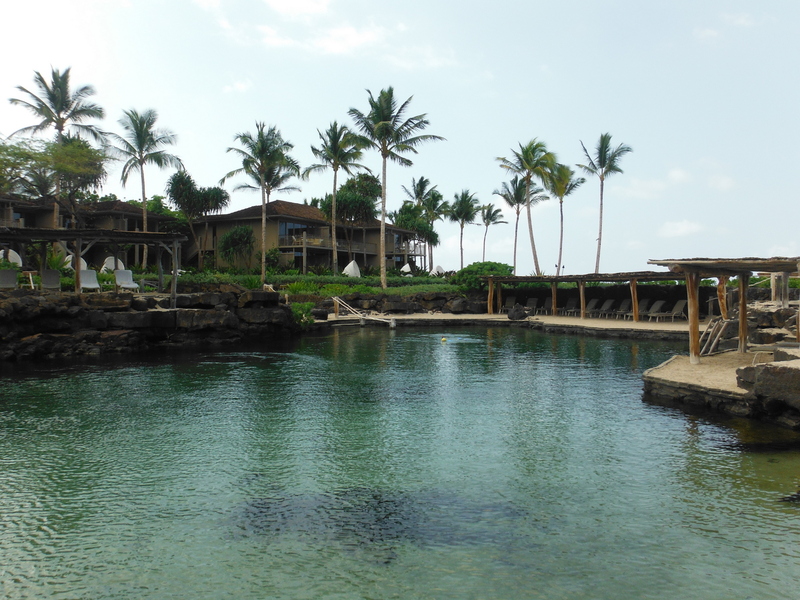 The Sea Shell pool (aka Kids Pool) is another beautiful infinity pool. On our first day we sunk down into what may be the best seats in the house. Right next to everything including semi submersed loungers with a minihut above. But it was our first day so we continued pool hopping and then we found King’s Pond. For someone like me who doesn’t think twice about driving the limit on the autobahn or sliding across metal on a snowboard I must say I get intimidated by unusual sea creatures. This is the beauty of King’s Pond, even a guy like me who nearly needed a change of pants when I first saw the Eagle Ray by the second time I was totally engrossed in the beauty to see. 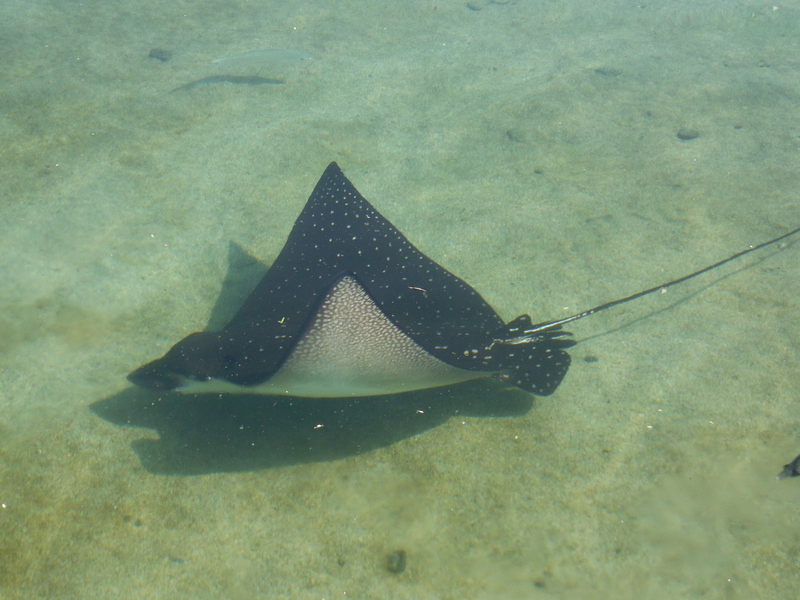 There is a daily eagle ray feeding at 1pm Mon-Friday I highly suggest you sign up for. It fills up so get your name on the list early; it opens at Kings Pond at 10am. Once I fed that eagle ray my confidence and snorkelling enjoyment just shot up like Trumps ego when he’s on TV. After we checked out of the Orchid we did a bit of Christmas shopping in Kona and bought snacks and breakfast food prior to checking in. Truthfully I was expecting to pay $30+ for dinner entrees all week. 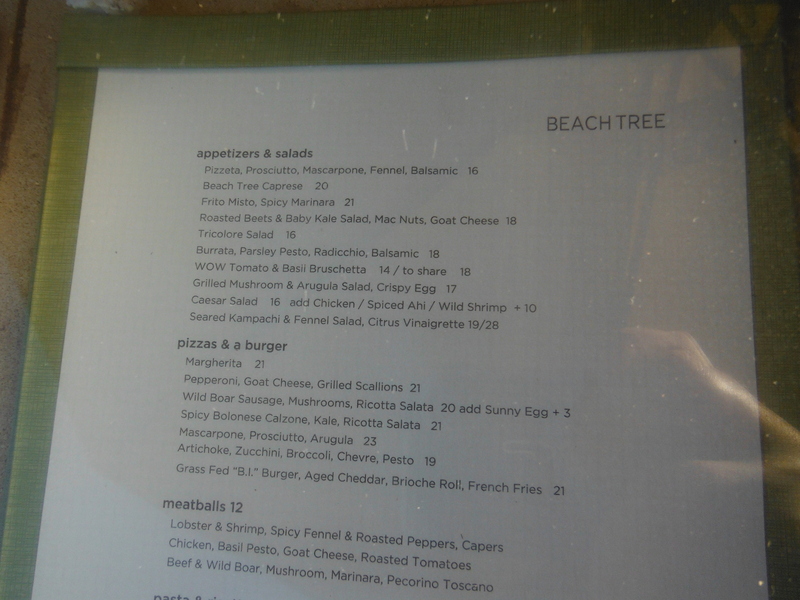 Our first night we had dinner reserved at Beach Tree. After I little mix-up since our reservation was made for January instead of December by the concierge we got a table pronto. 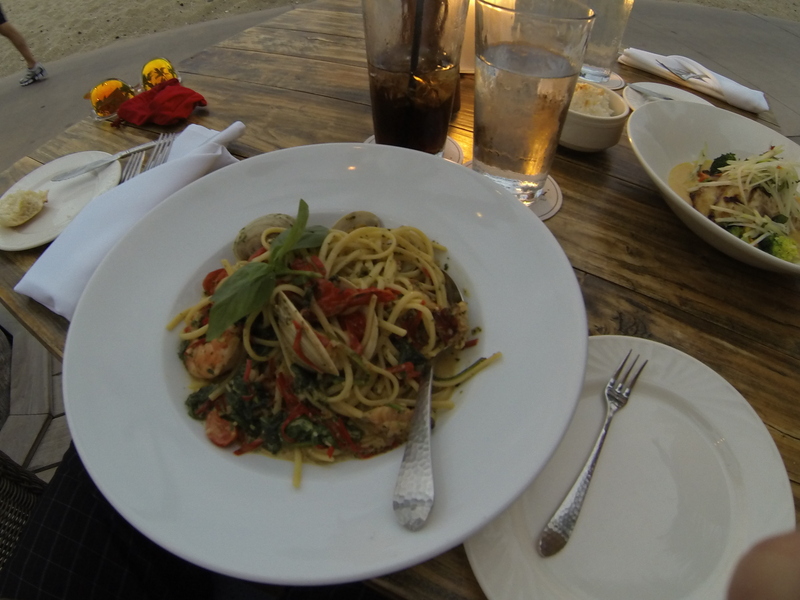 Service and food at Beach Tree were excellent. 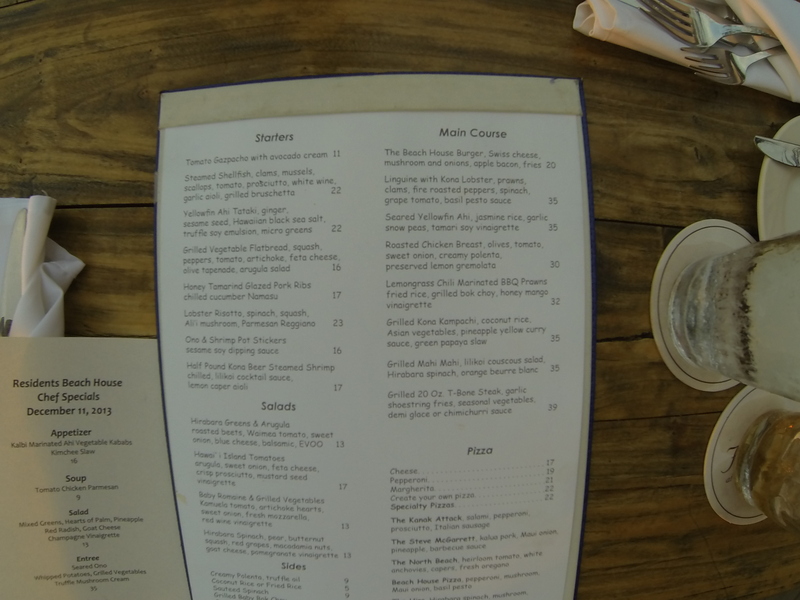 In total we tried the burger, Mascarpone Prosciutto arugula pizza, alfredo, lobster risotto, lobster pasta in bread bowl, chef Nicks grandmothers gnocchi and all these entrees tasted great. 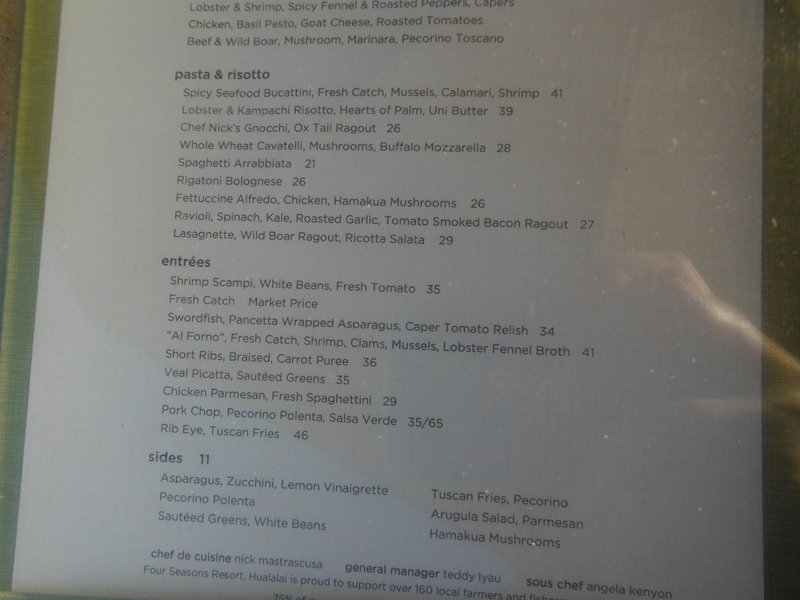 The risotto did have a strong seafood taste and we just ordered a half order as a side. That’s another beauty; most requests are granted and often encouraged. 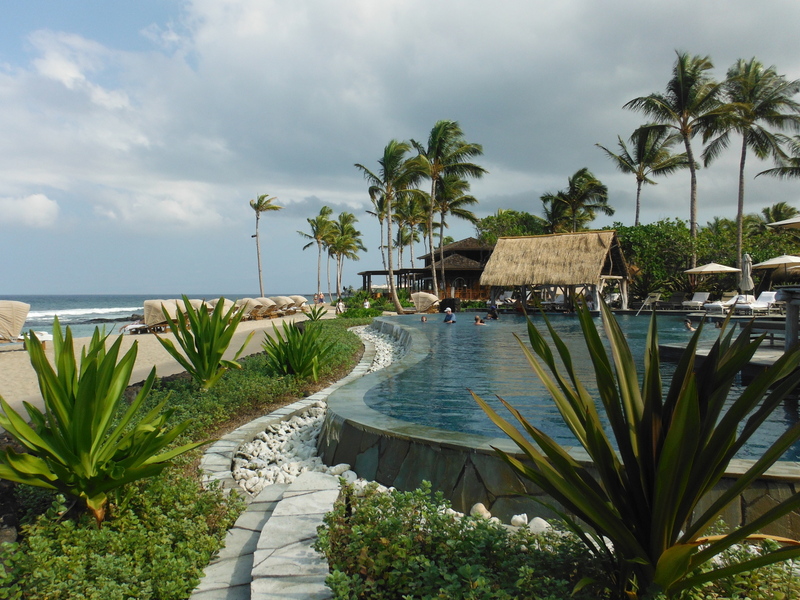 We also dined poolside and the staff made it an easy experience. Food is quick to arrive and tastes very fresh. I had the Mahi Tacos and Burger and would order both again. I’m a fan of the onion rings but the house salad is a great mix of different leafs. Now my favorite part of the food and beverage experience at the Four Seasons Hualalai has to be the adult themed popsicles. The pool staff walk around with treats every hour; fruit kabobs, ice cream, sunglass cleaning, cold face towels etc. But the adult popsicles filled with real fruit and booze are awesome. Instead of the usual welcome drink I will request a popsicle next time. I’m pretty sure it has more booze in it too. 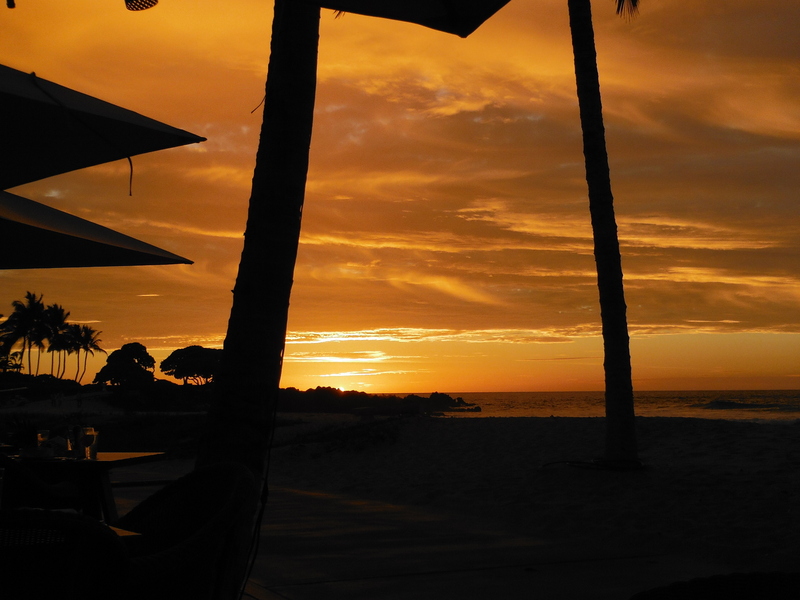 For the best sunset you may ever experience get a table at the Residents Beach House which hotel guests have access too. Enjoy a cocktail and watch the VOG (Volcano Fog) turn the sky red, orange, purple, blue all at the same time. 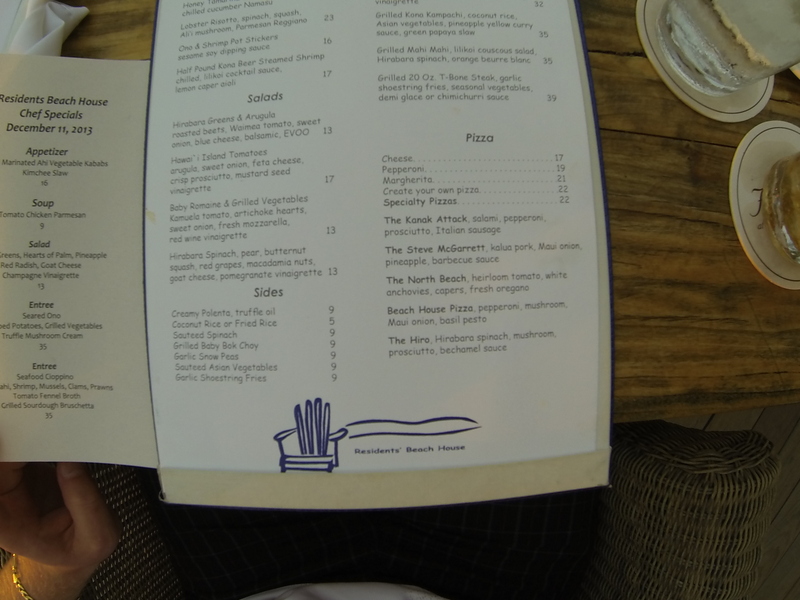 The Beach House is also open during the day and at 5:30 has a more extensive dinner menu with Burgers and Pizzas for $19-$23 and finer entrees at the $35 mark. The newest fine dining option is ULU restaurant. 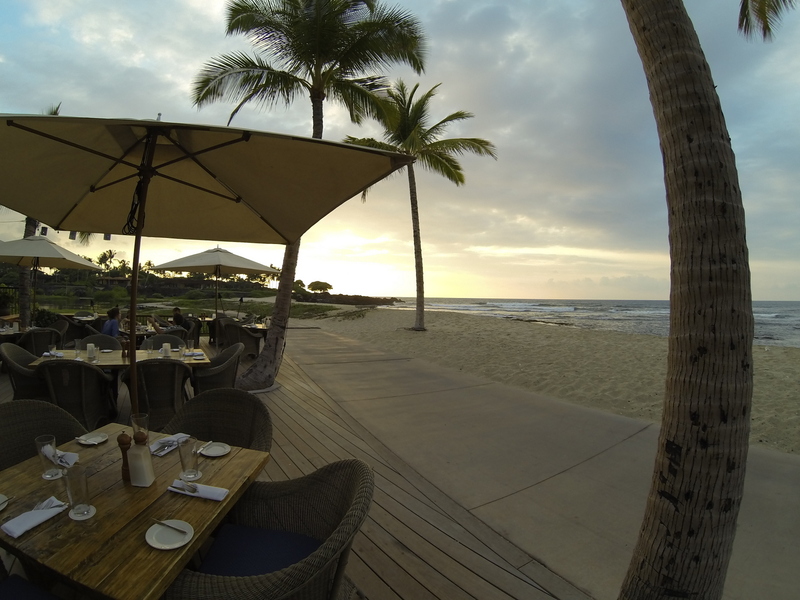 The breakfast buffets take place on their beachside tables and at night it satisfies your Japanese and fresh fish cravings. We enjoyed a few of the rolls here one evening and dessert. 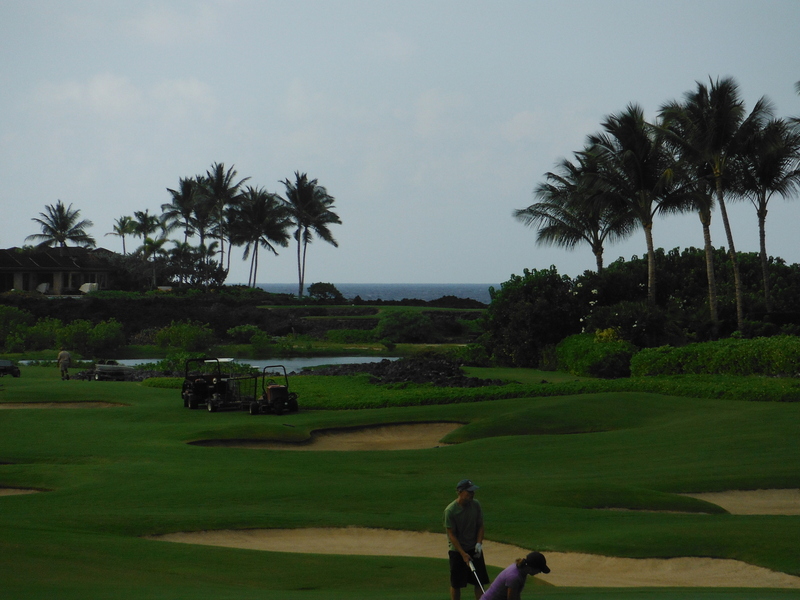 The resort has two 18 hole golf courses however only one is available for hotel guests to play. They charge $250 for an all day golf pass. 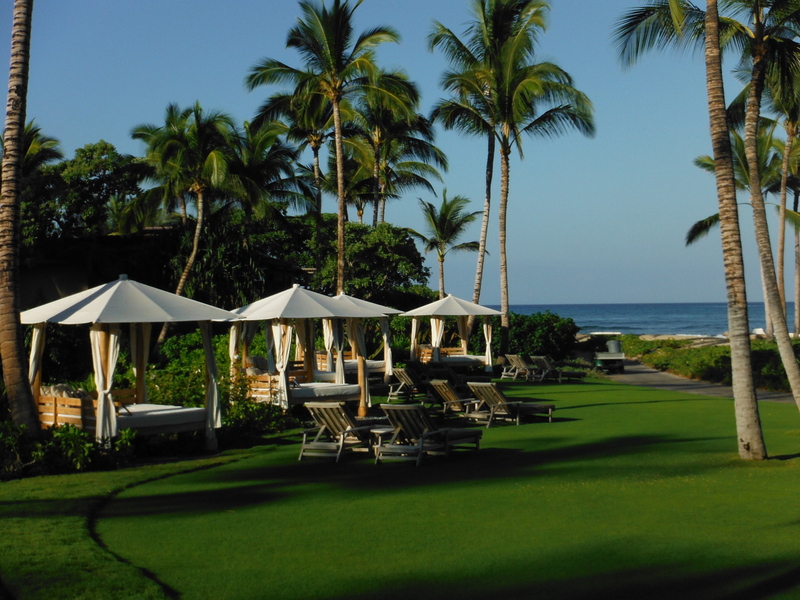 The 17th hole is a spectacular par 3 along the oceanside and the Hualalai Grill is a great spot for an après round adult beverage or to enjoy dinner. 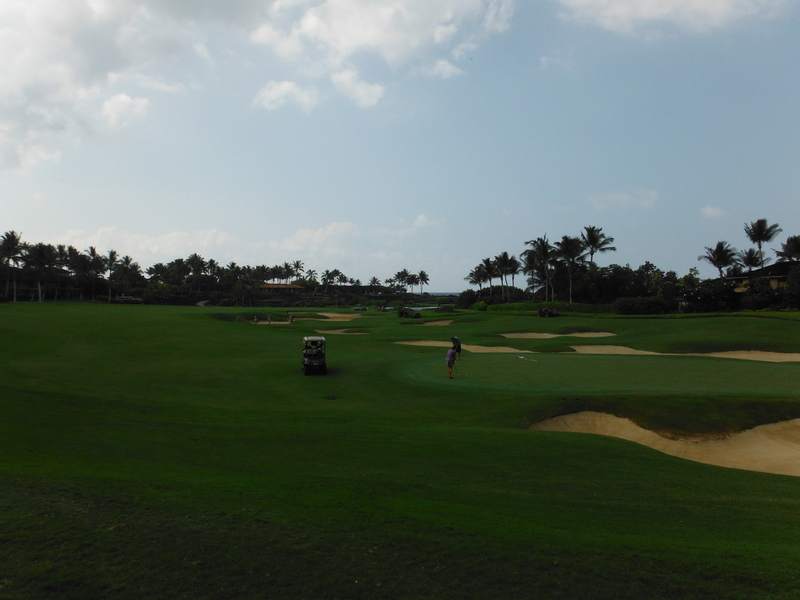 The course is only open to residents and hotel guests so you may be able to finish your golf rounds in record time. 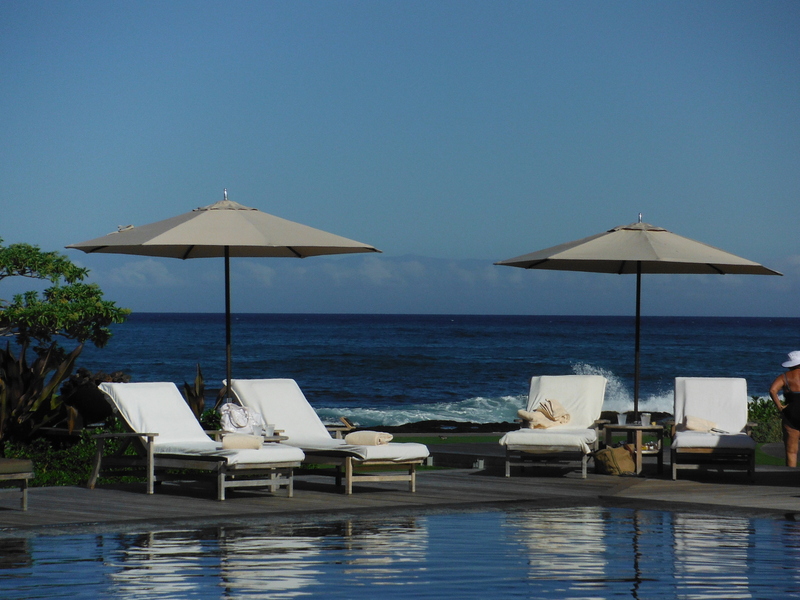 In case you are in need for complete solitude the Four Seasons Spa can fulfill this. 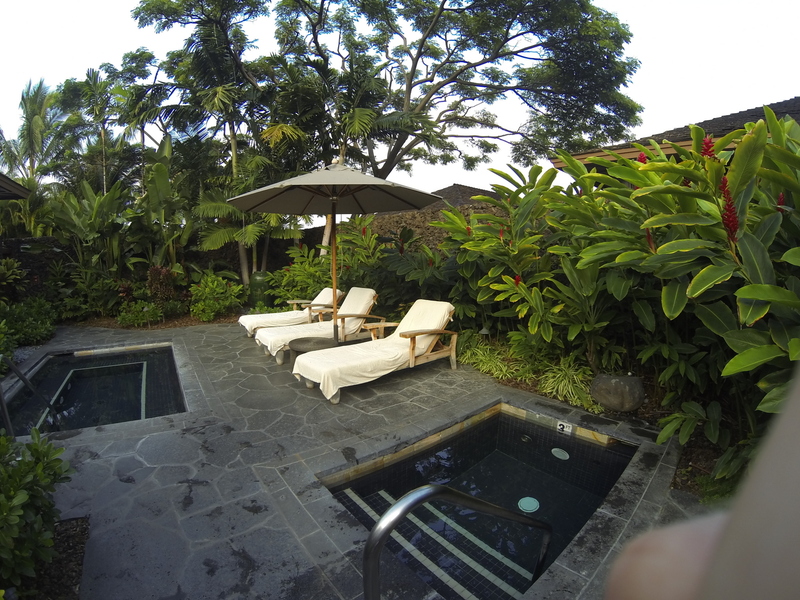 There is a separate pool by the SPA, fitness area and tennis court. At the men’s locker area there is a sauna, steam room and both a hot and cold tub. 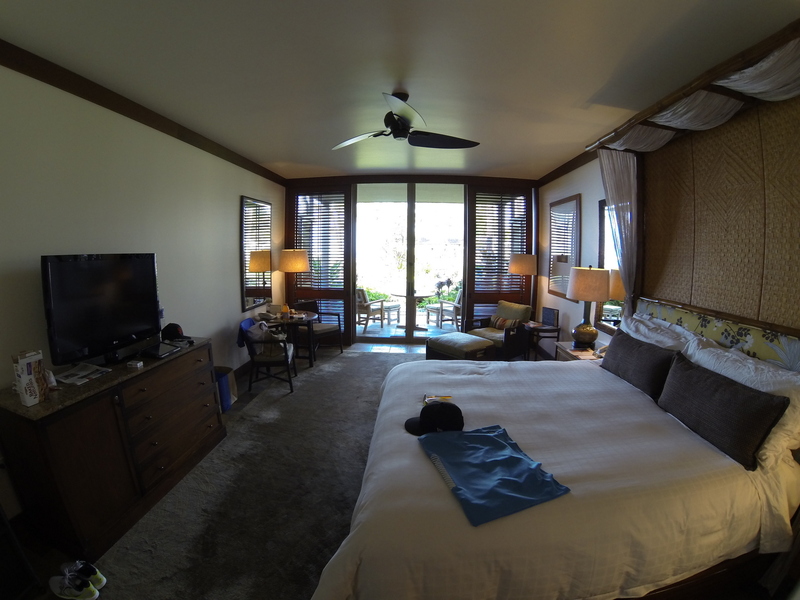 In addition you have a television area and excellent service from the locker room attendant. 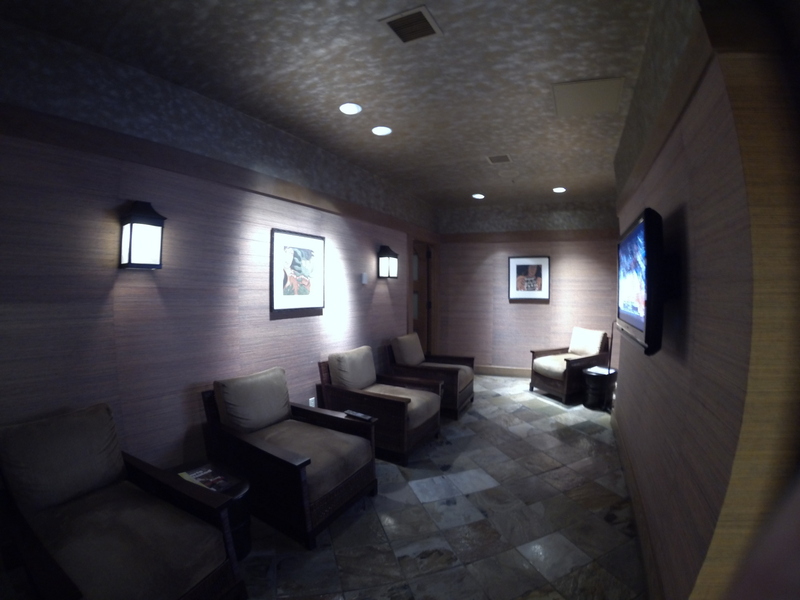 Outside of the locker rooms is a tranquil garden you can relax and enjoy some peace and quiet. The best part of the spa is there is no additional fee for using the facilities and in case you arrive early or depart late it’s a great place to freshen up and store a few things while you are waiting for your room or late night flight. Keep in mind the hotel offers any guests in these shoes full access to all the hotel facilities too. 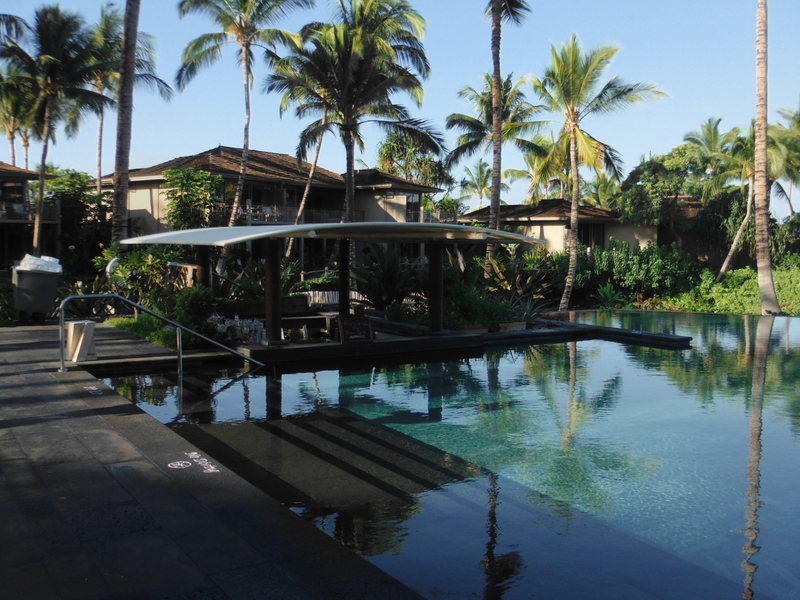 Overall the Four Seasons Hualalai really impressed me on all fronts. 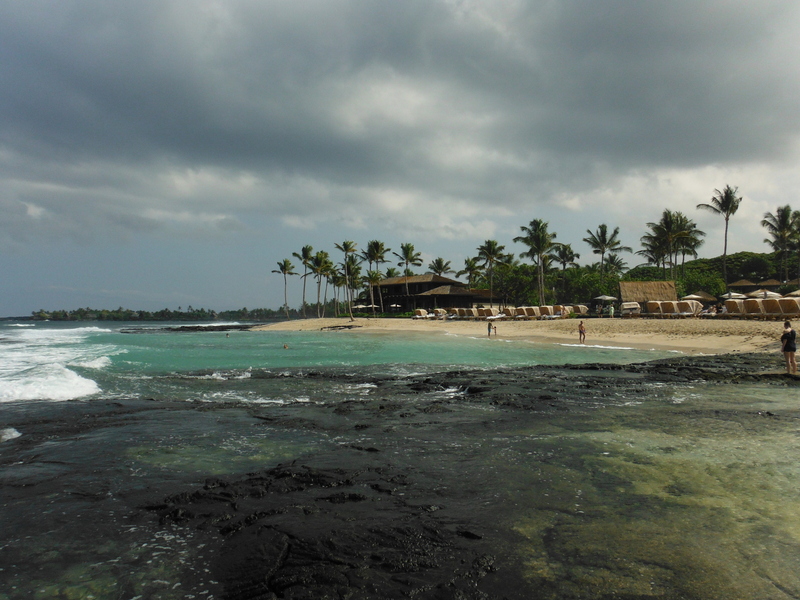 It didn’t nickel and dime like many of the higher end resorts in Hawaii. 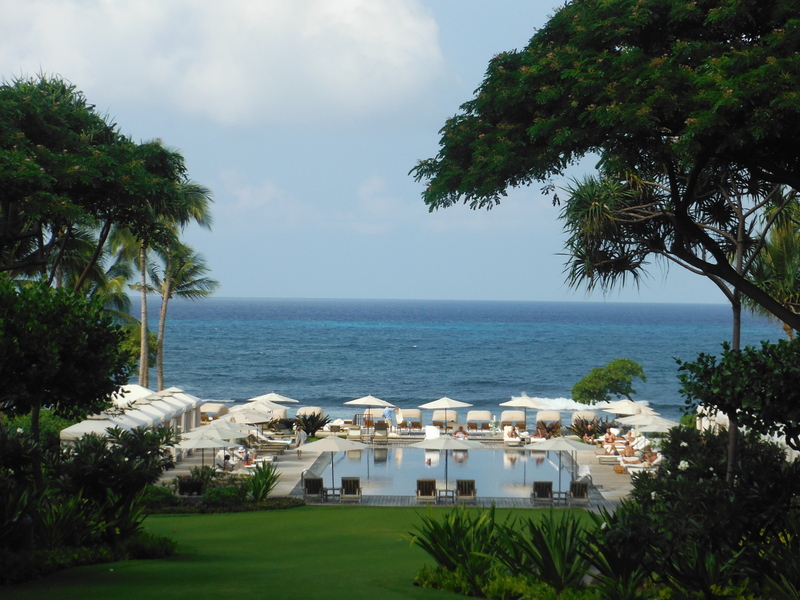 No resort or parking fees, drinking water supplied night and day, no fees for cabanas, dining value and no need to reserve beach chairs early stood out compared to a few of the other luxury hotels I’ve stayed at in Hawaii. Service was exceptional and the grounds are stunning with plenty of options to enjoy. I wouldn’t hesitate to recommend this hotel to anyone. 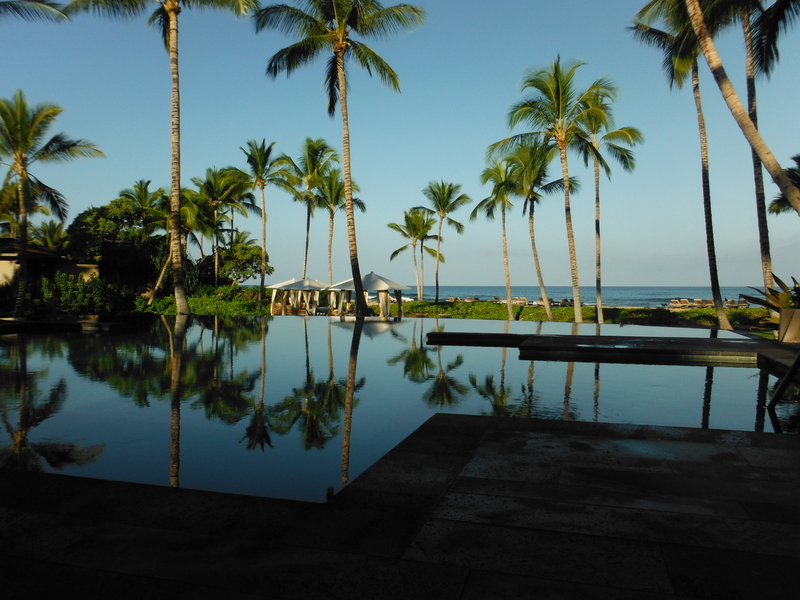 This entry was posted in Hotels, Trip Reports and tagged Big Island, Four seasons hotel, Hawaii, hualalai. Bookmark the permalink.